Banya Bashi mosque is located in the central part of Sofia and is the only functioning mosque in the town. 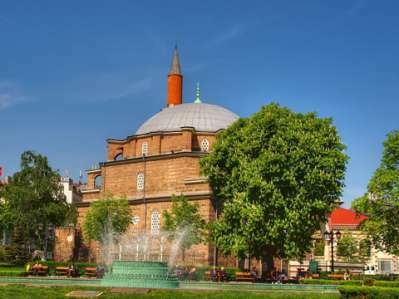 Banya Bashi mosque was built in 1576, during the years of the Ottoman rule of Bulgaria. 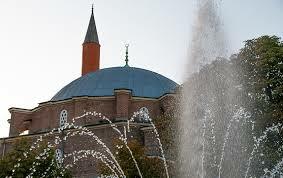 The Mosque is famous for its large dome and the minaret rising upward to the sky. The Banya Bashi Mosque is built in memory of the late wife of Molla Efendi Kada Seyfullah, who financed it – thus it is also known as “Molla Efendi”. It is designed by the famous Ottoman architect Mimar Sinan, responsible for the construction of more than three hundred major structures and considered the greatest architect of the classical period in Ottoman architecture. One of his students later participated in the design of the Taj Mahal. The exterior isn’t that special, but the interior is absolutely spectacular. 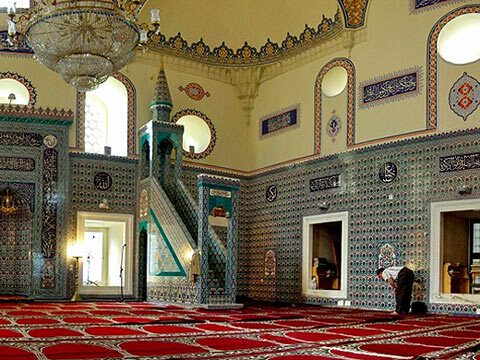 The midrab and the eastern wall are covered in aquamarine tiles, tiles with calligraphy, citing texts from the Koran and as the portrayal of human figures is banned in Islamic art there is a large tile with an image of the Kaaba, the mosque in Mecca to which all Muslims must make the hajj or pilgrimage at least once in their lifetime. What is notable for the mosque is the domed ceiling, which was restored to its original design, after the fall of Communism. It is also decorated with exquisite calligraphy. The dome has a diameter of 15 metres, and the building is the only remaining example in Bulgaria of a domed roof on a cubic base. There are also the ruins of a hammam next door. Banya Bashi mosque is not officially open as a tourist attraction and there is no entrance fee. Visitors are welcome outside prayer times, including women, if modestly dressed. Remember to take your shoes off when you enter. You can take photos inside the mosque, although its always best to ask as there may be someone praying at the time of your visit.